Dissolution Cycle - Welcome to the Paha Sapa Grotto! 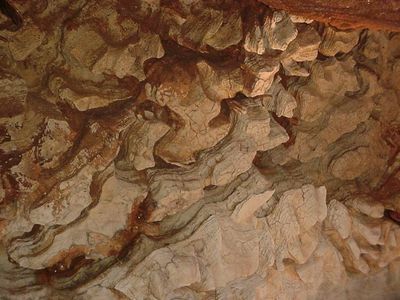 Karst and Caves features are all related to the chemical solution and dissolution processes that modify and sculpture all common soluble bedrock types. These susceptible rock types include rock salt (halite/sylvite), potash, trona, gypsum , dolomite and limestone. In the case of the highly soluble evaporites like Halite, Potash and Trona, the formation of solution pockets, sinks and in some cases caves, is just a matter of water solubility. Ambient temperature precipitation and groundwater are highly undersaturated with respect to these halide and bicarbonate compounds and will rapidly dissolve large quantities of in-situ rock along fractures, bedding planes and surface exposures. Subsurface solution features within these rock types tend to be small, fragile and very short lived due to their high water solubility, but these rock types readily form karst solution pinnacles on surface exposures. These features, however, are generally only well developed and observable in extremely dry environments. In the region immediately surrounding the Black Hills Uplift, there are no widespread occurrences of these types of evaporite deposits, but such evaporitic minerals do occur as minor admixtures in some of the beds in both the Spearfish and Minnelusa formations. Dissolution of these minerals along with the gypsum layers in which they occur has had a pronounced effect on the karst features found in these two formations. Gypsum (CaSO4 · 2H2O) with lesser anhydrite (CaSO4) occurs within several formations exposed in and around the Black Hills area. These minerals are also water soluble, but far less so than the other salts mentioned above. These two sulfate compounds have less than 1% of the water solubility of the halide and bicarbonate salts. They are, however, considerably more soluble at higher temperatures and especially in the presence of acidic solutions. Rising thermal water have both of these attributes and can produce very significant karst within rocks of this type. They more commonly, however, can be seen to undergo dissolution in the presence of ambient temperature meteoric and ground waters, albeit much more slowly. The karst and caves that locally develop in gypsum tend to be much more extensive and longer lived than those in the other rock salts, because of the higher mechanical stability that comes with being less soluble. 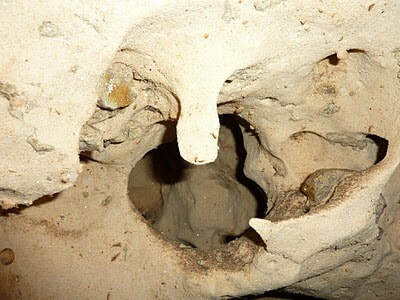 Even in view of this higher stability, however, gypsum caves are quite fragile and highly prone to breakdowns relative to limestone caves. The Spearfish formation contains a thick bed of gypsum near it's top and has stringers and thin layers of gypsum throughout its entire thickness. This formation rings the Black Hills uplift as the “Red Valley” or “Racetrack” as it is locally known. This unit contains widespread karst features that include solution domes, breccia pipes, sinkholes and local caves, particularly where the beds are intercepted or transected by flowing springs. Most all of the speleologically significant karst in the Black Hills is contained within the Limestone strata of the Madison (Pahasapa) Limestone. Limestone is almost entirely composed of the calcium and magnesium carbonate minerals, calcite (CaCO3), aragonite (CaCO3) and dolomite (CaMg(CO3)2). All of these minerals are sparingly soluble to insoluble in water at surface and near subsurface temperatures. 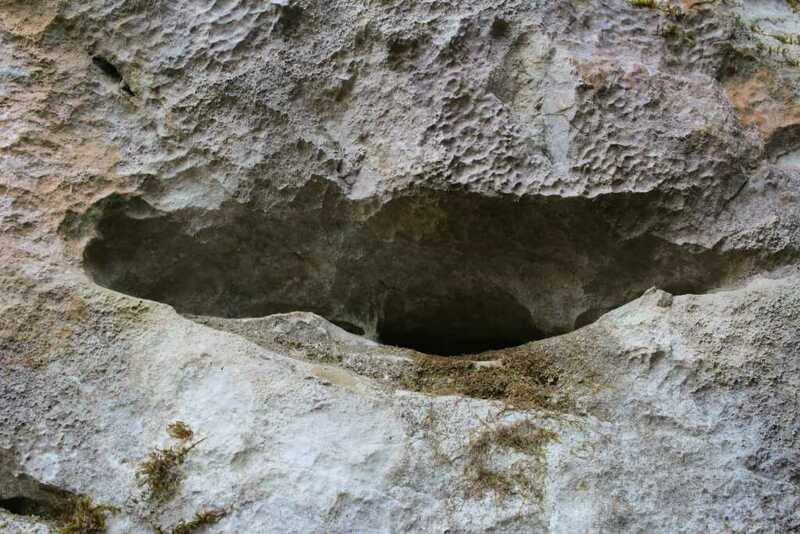 Limestones will, however, dissolve measurably in the presence of soil and atmospherically derived acids when adequate water is available, and this is the basis for the primary dissolution cycle of speleogenesis. Most of the process of dissolution is accomplished through the action of carbonic acids (H2CO3) which form from carbon dioxide and water in the atmosphere and soil. Both carbon dioxide and water are highly polar molecules and dissociate into ions rapidly and are extremely stable under normal speleogenetic environmental conditions. The following shows the carbonic acid - calcium carbonate dissolution reaction. This the most prevalent reaction taking place, but not the only acid mediated decomposition possible within the dissolution cycle, however. There can also be major contributions from the soluble organic acids that are produced by biologic activity within the soil. These acids consist largely of complex mixtures of polymeric compounds. These acidic compounds affect carbonate dissolution by increasing the total acidity of the soil. They also contribute to breakdown of inorganic minerals by acting as chelators, a class of compounds that surrounds and mobilizes metals in solution. The concentration of the soil acids in the epikarstic zone can sometimes be quite high, and they definitely assist in keeping the available hydroxyl ion concentration [H3O+] elevated within the epikarstic zone. The following reaction shows how carbonic acid reacts with the calcium carbonate in limestone. Gases like CO2, N2 and O2 become increasingly soluble in water as the temperature drops or as the pressure increases. Both of these conditions are met as water sinks from the upper epikarstic zone into the cooler vadose and phreatic zones at depth. Furthermore, as calcium carbonate dissolves, it releases more CO2, and induces a feedback loop that generates more carbonic acid as long as there is adequate water available for the reaction to proceed. Note that the hydroxyl Ion [H3O+] is shown in the above diagram in standard ionic shorthand notation as H+. From a chemical reaction standpoint, these forms are equivalent . The effects of increased pressure on the solubility of carbon dioxide as the solution works its way down the solution column can be quite significant. Within the first 30 feet of a saturated column of water at 20°C, carbon dioxide solubility increases by a factor of 20 and a liter of water can readily dissolve as much as 0.7 liters of gas at the bottom of the column. The effect of this increased solubility means that as more carbonate is dissolved, more CO2 is released into the solution and it stays dissolved,where it forms more carbonic acid and increases the capacity of the solution to dissolve additional carbonate. Although this process takes place throughout the entire flow path, the cycling and recycling of the CO2 takes place most efficiently in the phreatic zone below the water table. The above diagram shows a general schematic of the carbon dioxide – bicarbonate cycle within the epikarstic, vadose and phreatic zones. There are countless other reactions that take place within the karstic cycle, a number of which can enhance the dissolution process within the carbonate bedrock. Other reactions can either slow down the process or change the dissolving solutions in ways that have effects in the down-gradient portion of the system. The following sections outline a few of the characteristics of the major reaction types, and the effects they typically have on the overall process. Many of these reactions involve the reactions of carbonic and other acids with the inorganic silicate and oxide minerals grains that are typically dispersed in varying proportions throughout the limestone matrix. This process involves acidic hydroxyl ions and releases small quantities of metal ions into solution in a process known as hydrolysis. These reactions are acid consumers and initially tend to slow the overall dissolution process by limiting the availability of acidic hydroxyl ions. The following reactions illustrate two common hydrolysis reactions that produce one of the clays commonly found in karstic soils. Because these reactions produce hydroscopic clay minerals, they help in the long run to increase the retention time of water where they are present. This decrease in flow rate often aids in the further decomposition of carbonates by slowing the rate of acidic hydroxyl [H3O+] ions through the system and allowing more time for reactions to take place. Additional hydrolysis reactions occur that involve the metal ions formed in the types of reactions described above. These ionic exchanges in solution cause the formation of hydroxide (OH-) bearing precipitates and regenerate the acidity [H+] of the solution. This process most commonly occurs where the mixing of descending acidic waters blend with less acidic groundwater, at or below the water table. The result is the precipitation of metal hydroxides that are incorporated into mineral growths, crystal structures and surface coatings. A few common examples of these hydrolysis reactions are shown in the following list. Many metal hydroxides are quite colorful, and the ions that produce them are often referred to as "chromophores". These ions are important factors in the development of the colorful formations found in caves worldwide. Metal ions available for hydrolysis are not only derived from the inorganic minerals and oxides found in carbonate sediments, but also from the structure of the carbonate minerals themselves. Any metallic ion with a +2 charge can substitute for the calcium in carbonate minerals, and impurities of this type are found at various levels in most limestones and dolomites. The list above is my no means all inclusive. Both copper (Cu+2) and uranium (U+2) ions are typically present in only trace quantities in carbonates, but they can be important components in the precipitation of late stage minerals. Uranium in particular is a widespread trace constituent in limestones and has a major role in determining the geochemical makeup of cave atmospheres. There are also reactions involving dissolved oxygen that attack any sulfide mineral growths that may be present within the limestone. Diagenetic sulfide grains are quite common within carbonate sediments and related to their compaction and aging process. Many carbonates have reduced carbon that is trapped in their sediments during sedimentation. These sulfides can also be related to the reducing effects of post-depositional petrochemical migration through the host rock’s pore space. In some cases, particularly in the vicinity of hot springs or igneous intrusions, there may also be hydrothermal sulfide grains that were introduced much later as disseminations and replacements within the fractures and bedding planes of the host carbonate rock. All oxidation reactions involving sulfides have the ability to release strong acids into solution. These acids will profoundly increase the rate of carbonate dissolution wherever they are present. These reactions also release alkali, alkaline-earth and transition metals into solution which are incorporated into crystal structures in minerals that precipitate further down through the system (See "Hydrolysis Reactions" above and “The Precipitation Cycle” link on the bottom of this page). A few of the more typical sulfide oxidation reactions are shown in the figure below. All of the reactions shown either produce or consume sulfuric acid (H2SO4); the net effect is that much more of this strong acid is produced in this reaction chain than is used up. The acidic hydroxyl ions [H3O+] released from these oxidation reactions lower the solution pH, and increases the fluids’ ability to dissolve additional carbonate bedrock on it's downward path to the water table and on into the phreatic zone below. Speleogens are the name given to the class of morphological feature that formed as a direct result of the dissolutional process. They are a prominent feature in Black Hills caves, and are are a particularly common feature within the phreatic portions of cave systems in general. Speleogens are residual relief features on the surfaces of passage walls left over from the dissolutional process. These features can also be due to corrosion by flowing water and or unusual forms of chemical activity such as sulfide dissolution. They consist of readily recognizable shapes that include such features as scallops, fluted surfaces, anastomoses, meander niches, solutional siphons, petromorphs and rock pendants.